Whew. Yep, it’s that time of year again. Race season is winding down and 4th quarter at work is ramping up. The end of the race season is usually filled with “A” races which means after-work training takes precedence over everything, including blogging. I usually only have time for a Facebook or Instagram post, but that’s about it. With work, ramping up, it usually means more travel and getting work done after-hours because travel time is not always productive time. Now that the post-season break is here, I have some time for blogging (or blerhging as Rich calls it). 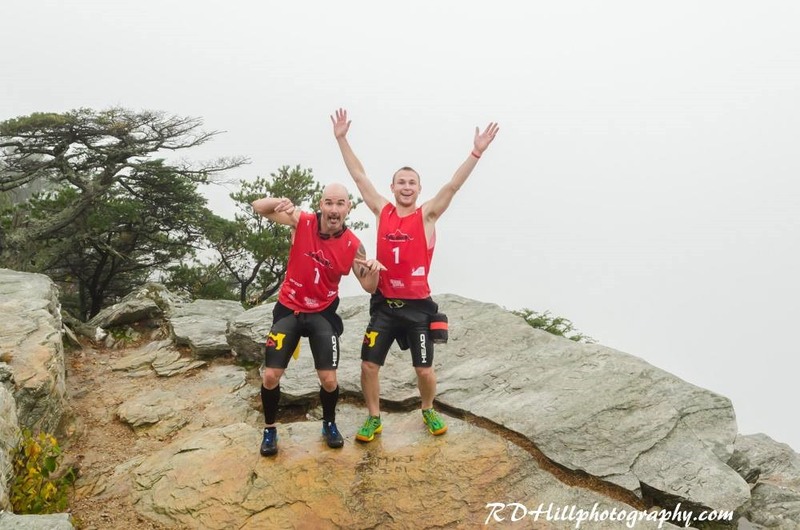 With that said, let’s get started with a SwimRunNC report-a-rooo. 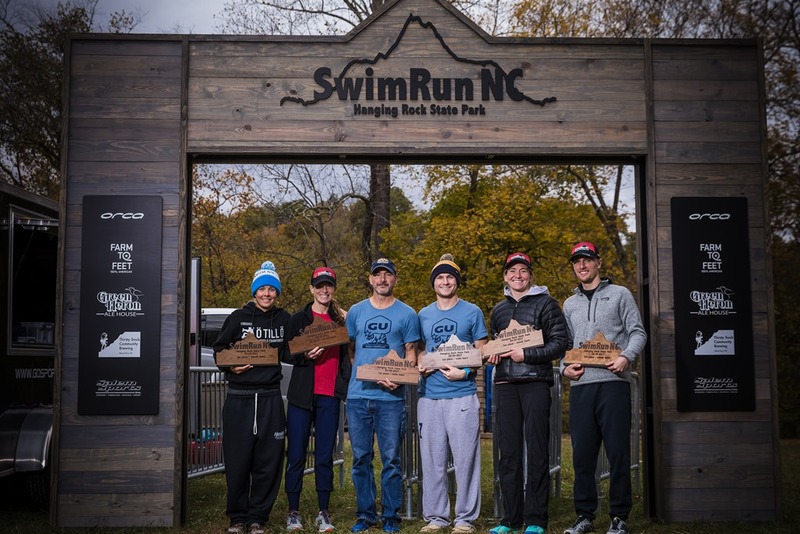 Some of my regular readers (all 4 of them) might be wondering why I’m doing a report on SwimRunNC before I do one on the Virginia race, since I raced that one first. Dunno. Let’s just do em in reverse order, so be on the lookout for that one soon. 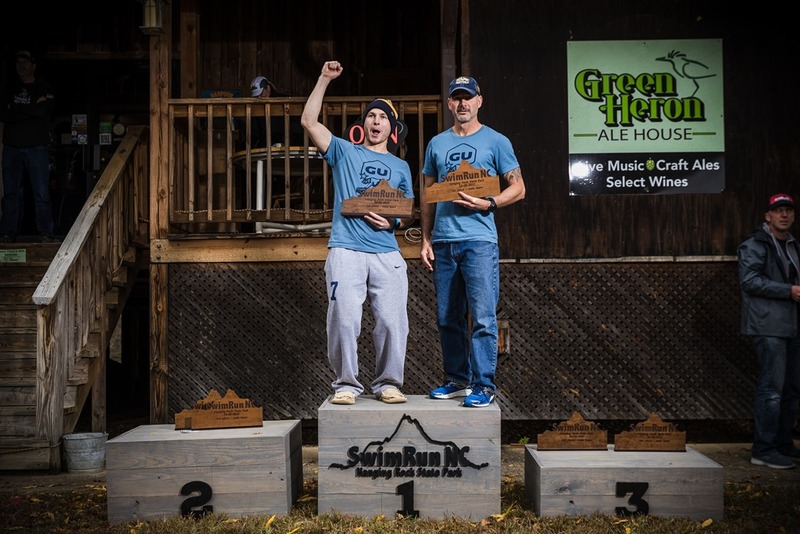 Caleb and I raced SwimRunNC last year and had a BLAST. We battled it out in the last 100 meters (or so) of the race to win the 3rd place overall spot. It was a tough battle, but we squeaked it out. This year, we went into the race with hopes of doing just as good, or better. 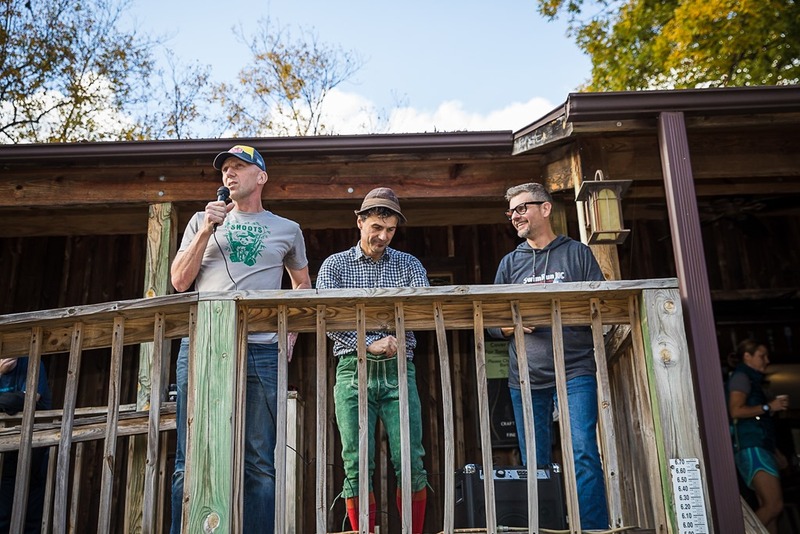 We showed up to the pre-race briefing hosted by Jeff Beckelhimer, Jan Kriska and Herbert Krabel and attended by a ton of fast racers at the Green Heron Alehouse. 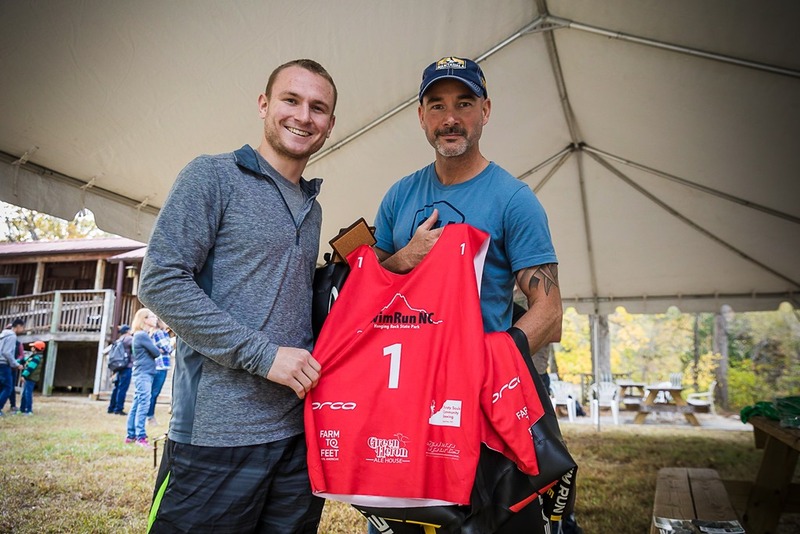 We were presented with our racing jersey which had a number that gave us some big shoes to fill. We headed out to get some eats and I ended up at Jan’s brewery, Thirsty Souls Community Brewing. 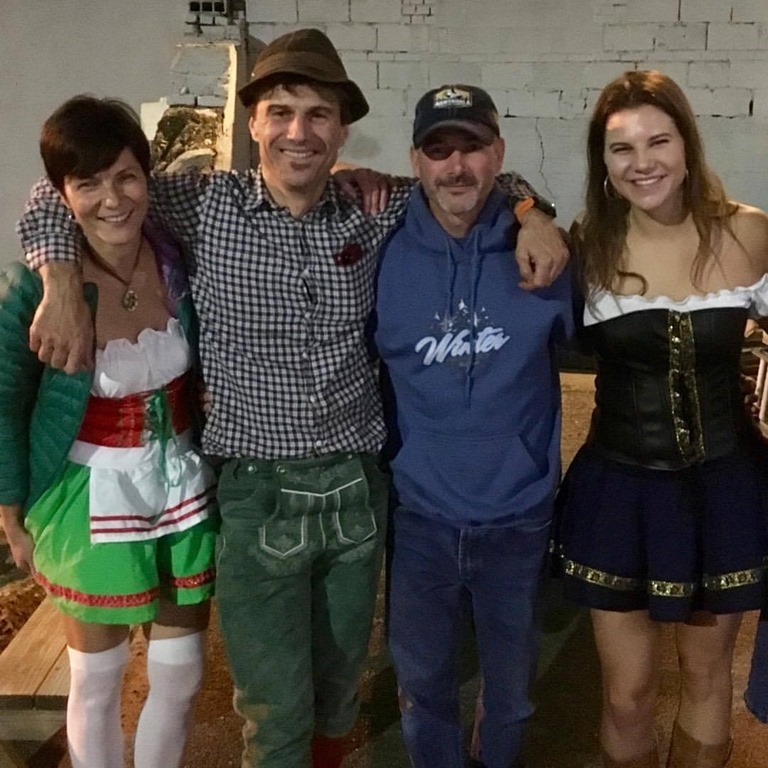 Their Octoberfest celebration was in full swing, complete with German outfits. I couldn’t help but to snap a pic with Jan, his two beautiful beer maidens, wife Maria and daughter Paulina. GREAT beer on tap! We arrived race morning and did the usual warmup and pre-race stuff and before you knew it, we were lined up under the beautiful, WOODEN start/finish arch. With a countdown, we were off! 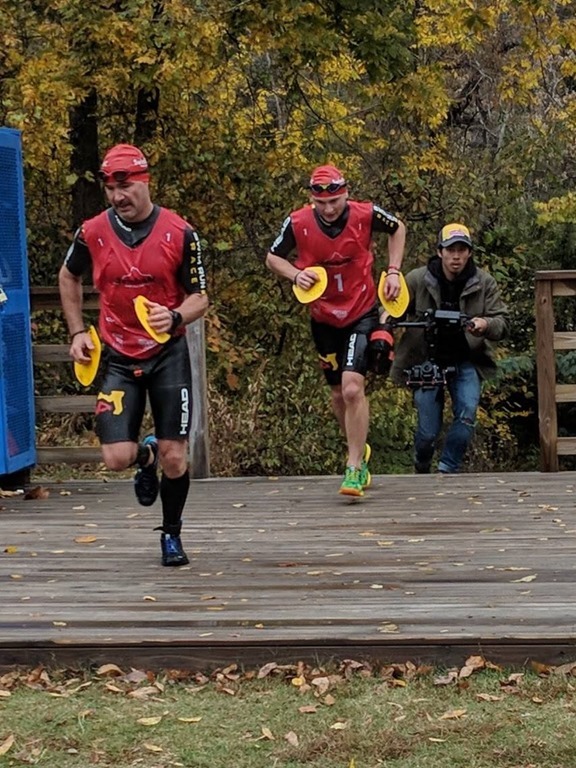 With the mass start, there was a lot of jockying for position as we ran down the gravel road headed towards single track trail, averaging a sub-6:00 pace most of the way. Once on the single track, your options for passing are limited and you almost have to go off-trail to get around. We wanted to be up near the front and had already planned on when/where it would be OK to pass. In one such area, we decided to pass during a creek crossing. In true Marcus fashion, I ended up on tripping in the water and going down briefly. I managed to keep my face out of the water, but still ended up landing kneecap first into a boulder. Within the first mile or two, we moved up to the lead and ran hard to extend the gap. 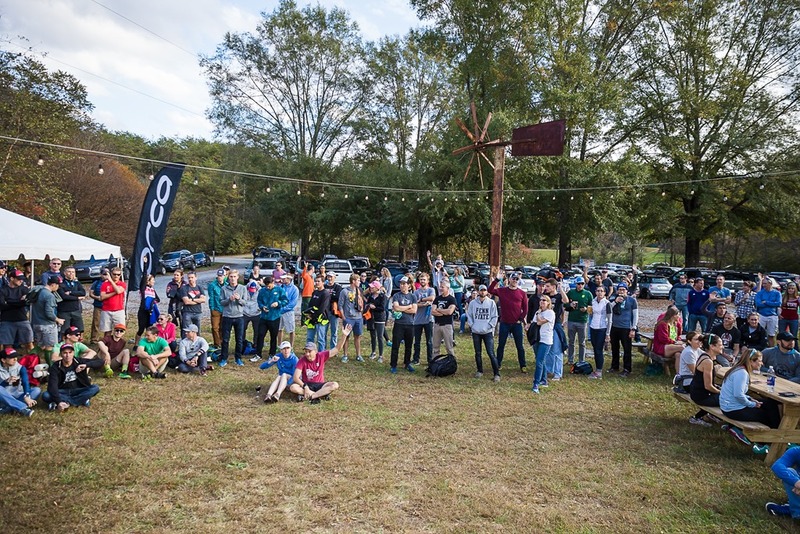 The first portion of the race involved a 4 mile (or so) technical run up (1000 feet) to the Hanging Rock Lake, with a quick run through Window Falls. 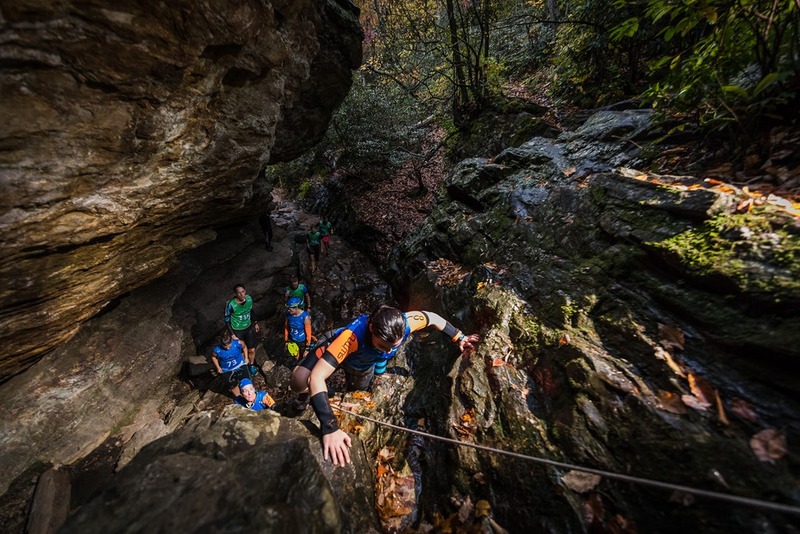 The race organizers included using the Window Falls as part of the course with several hand-over-hand climbs up the falls and over. We made it to the water’s edge ready for a dip in the lake where the temp was in the upper 50’s. 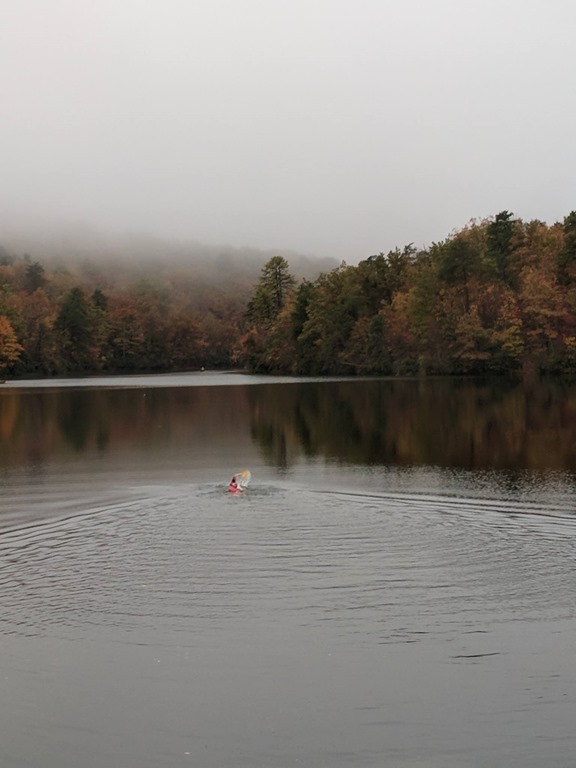 We hopped in and proceeded with two “laps” of a 500 meter swim and a short dip across the cove near the dam. At the end of each lap, you have to traverse the spillway just below the dam. This proves to be a bit of a challenge as you scale down the bank and over a very large, car-sized boulder. On our second trip around, I almost went back into the lake for a third swim. Between Jan and Caleb, they got me pointed in the right direction which was up to Moore’s Wall. I’m not sure what I was thinking, but I had my goggles on and was ready to go. Instead, we headed for Moore’s Wall. From the dam, the top of Moore’s Wall is another two miles of running, but with another 850 feet of climbing up over 600 steps. 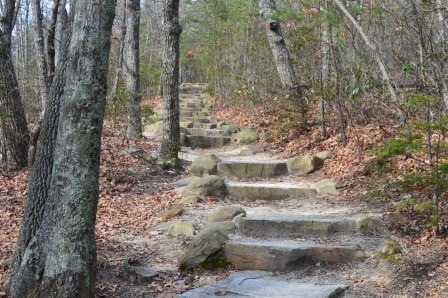 These “steps” are mostly rocks that have varying heights from a few inches to over two feet. Also, they’re not evenly spaced apart, so it’s quite a challenge to get into any sort of rhythm. Once at the top of Moore’s Wall, we paused for a quick picture and then headed out for our quick, technical scoot back to the lake. When I say “technical”, this is the most technical section of the course. For the two mile descent, you are met with jagged rock, after jagged rock. 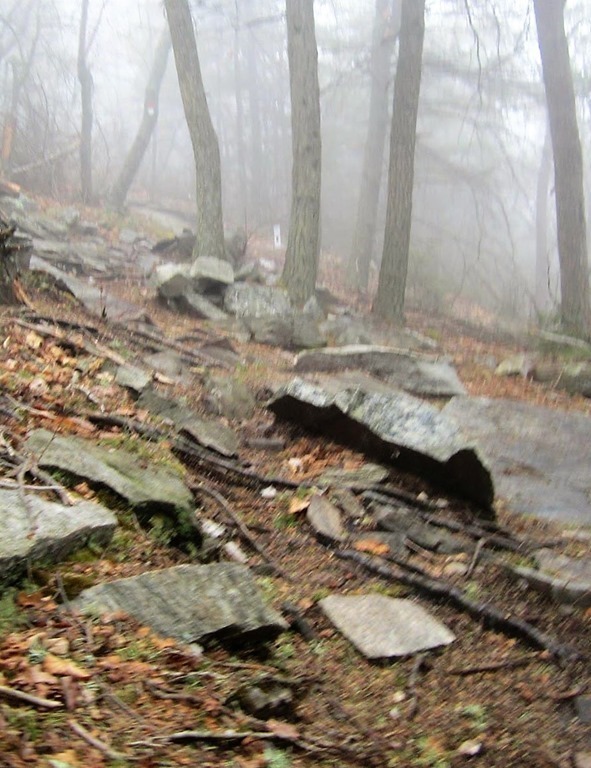 Having sure-footing and strong ankles is key to being able to go fast through this section. Since it had been raining and foggy all morning, they were all wet and slick. One wrong step could end with a heavy penalty, especially if you like your front teeth. Once back at the bottom, we had to do the same two “laps” around the lake. 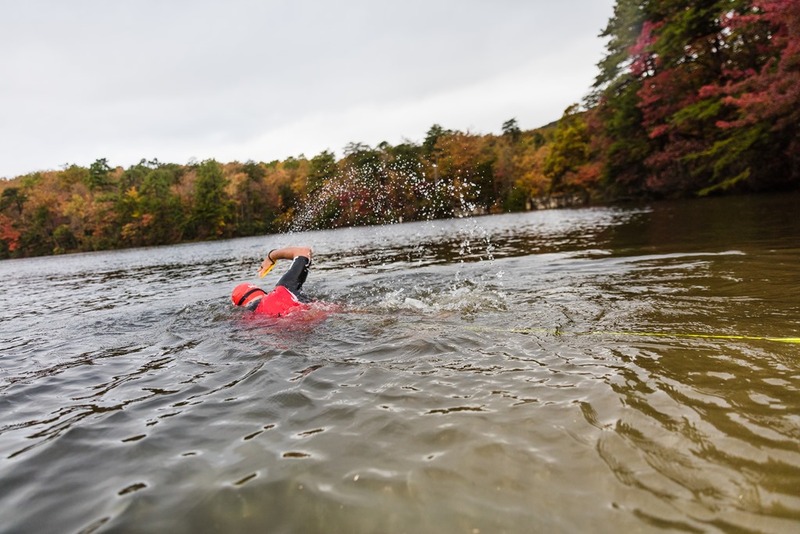 Again, the cold water was welcomed as we jumped back in for another short, 500 meter swim. Descending from the lake was the same trail/course that we ran up with the exception of Window Falls, descending the steps next to the falls instead. 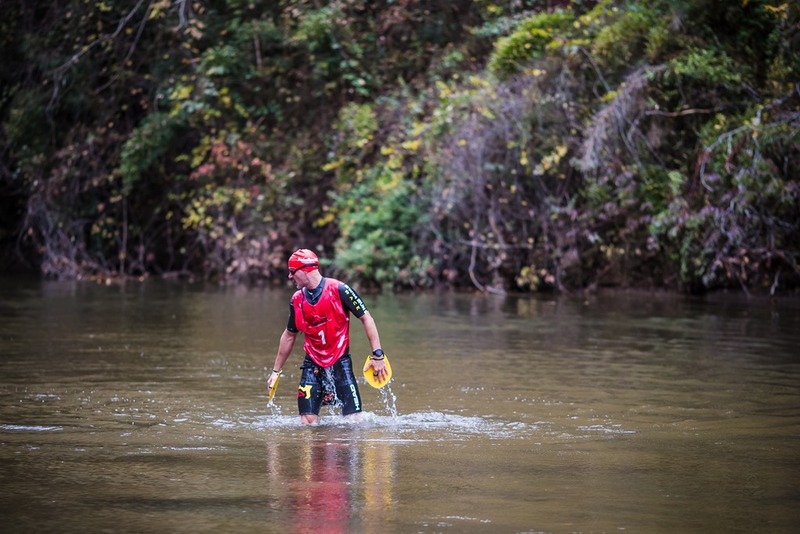 Once back down to the Dan River, we had to run alongside the river for a short distance before meeting up with race staff at the water entry. We dove in and began the last 800 meters of the race swimming downstream. The Dan River is very shallow. Some spots are swimmable while others you have to stand up and wade/run. It is also strewn with underwater rock croppings and boulders, so you have to “feel” your way through the river as you swim. At one point, I rolled over on my back to spot where Caleb was and to warn him of an upcoming boulder just below the surface. I glanced at my watch and noticed that we were only 3 hours into the race. I quickly realized that we had a shot at beating the course record. Caleb looked up at me and I pointed to my watch. “We can beat the course record! Let’s get it!” I yelled back to him and rolled back over to begin swimming again. 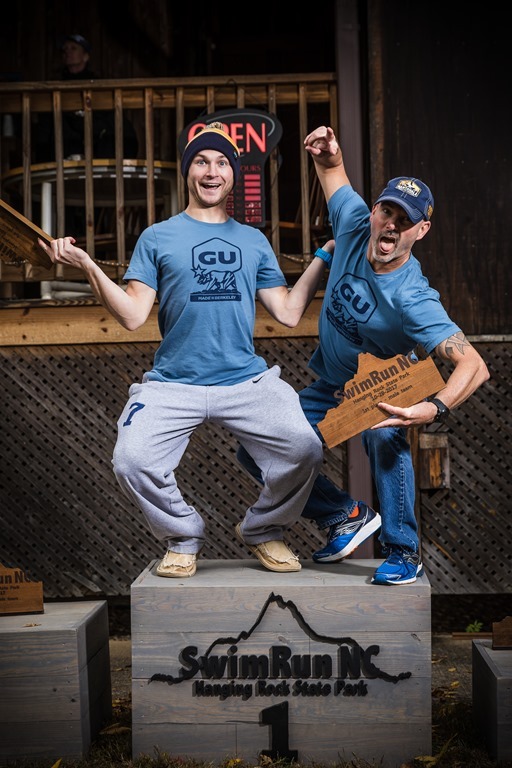 Once we hit a sandbar, I stood up, looked back at Caleb and again stated we could beat the course record. We both took off running. We made our way to the stair exit just behind the Green Heron Alehouse and with a quick run up the steps, ran across the finish line. 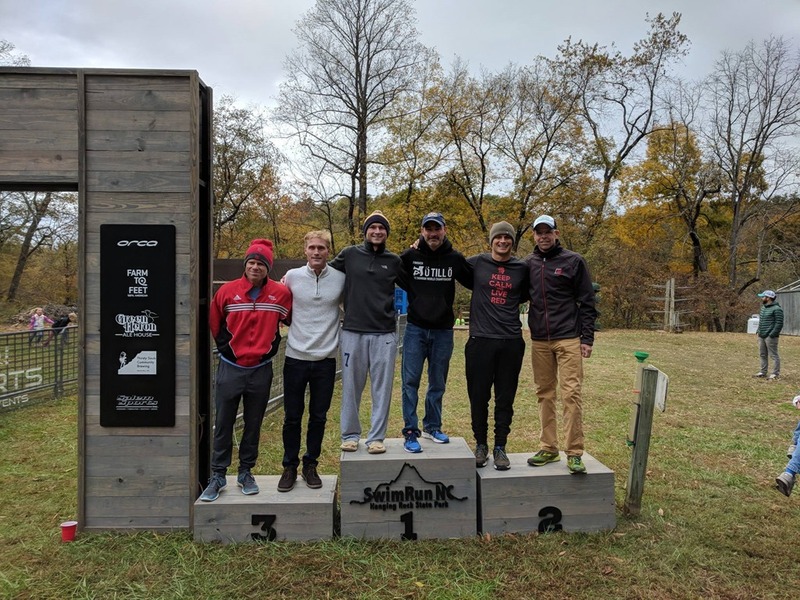 We ended up breaking the course record with a finishing time of 3:06:28. We had all but dismissed our chances of breaking it and it was a total surprise when we were in the Dan River and determined it was possible. We were just too pre-occupied with being chased. Our friends, Jim Fisher and Michael Harlow from Richmond, Virginia, came in second and the third place team was Jade Costen and Tim Starets. Here’s the winning male, female and mixed teams. For the female team, it’s Kristen Jeno and Jennifer Ledford. For the mixed team, it’s Amy Krakauer and Marcus Carson. 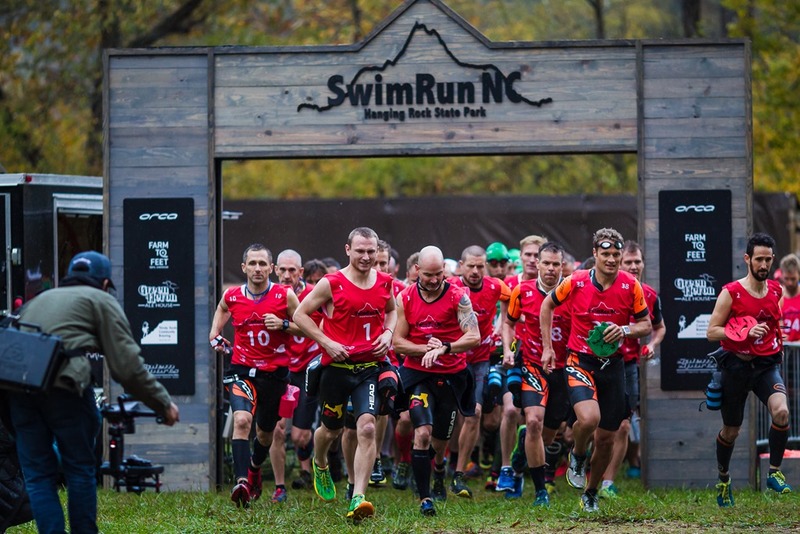 SwimRunNC is one of the events I was really looking forward to this year. We had such a good time last year, but this year Jeff, Jan and Herbert stepped it up another notch. Their combined passion for this sport and this event is unsurpassed. 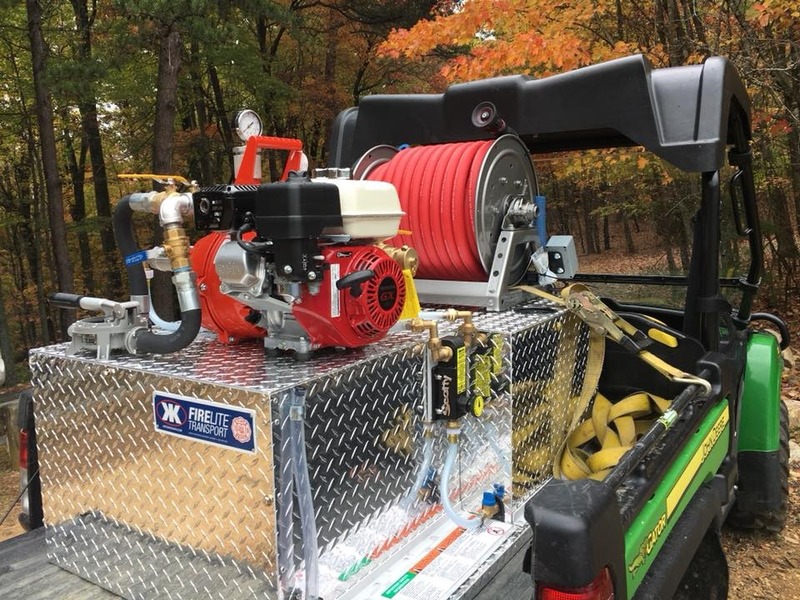 They are equally passionate about the venue, purchasing a mobile firefighting apparatus for the park with the proceeds. You could really tell that they tried hard to improve every aspect of an already great race. Some things were easily noticeable like the beautiful start/finish arch, while other small details, although not as immediately apparent, were not overlooked. Trophies and swag were improved upon as was the after-race food and drink. Another improvement was an increase in fresh, crisp Benjamins for the top three teams in each class. 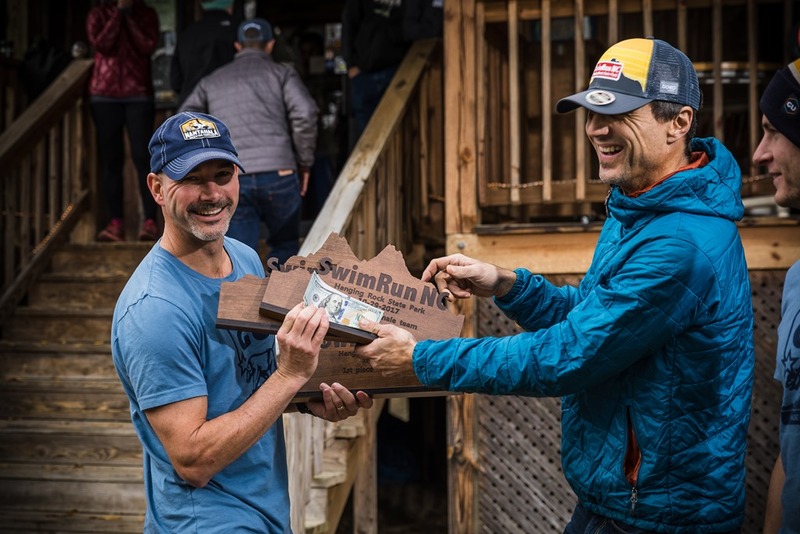 We really, really love the laid-back, unpretentious, non-elitist atmosphere of swimrun and this race proves that even further. 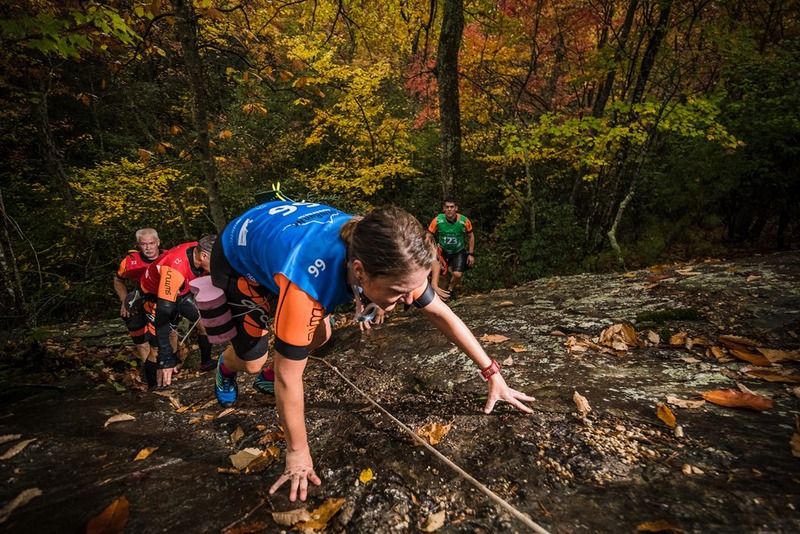 If you have thought about giving a swimrun a try, if you’re tired of pounding the pavement, if you’re ready for something fun and different, you should definitely give this race a shot. Everyone seemed to enjoy themselves and smiles were abound. Why would you want to go to a race where the racers are all so serious? Unless otherwise specified, these great photos came from Brian Fancher photography. Brian and his son took AWESOME photos. 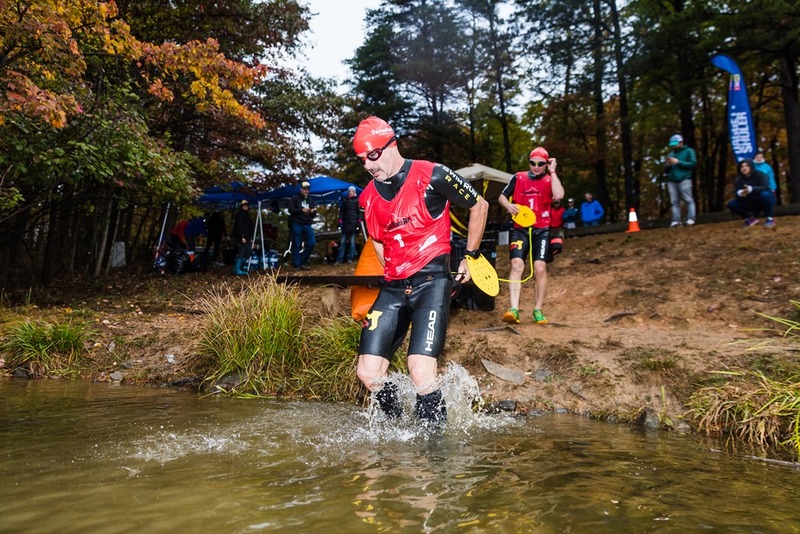 If you want more information on the race itself, head over to the SwimRun NC website, which has good info, but the BEST information is continually posted on the SwimRun NC Facebook page. Products used: GU Roctane, First Endurance Multi-V. Going to have to give a swim run a shot! Great write up.